Hiari turned the key and killed the motor. The rough rumbling of the old diesel engine died with a tired cough, and the flat-bottomed boat glided smoothly and silently towards the riverbank. Sitting in the bow, a young tourist couple snapped photos with their phones, chattering excitedly as they approached the edge of the mangrove forest. Covered by the boat’s dingy canopy, a pair of ridiculous wide-brimmed hats, and litres of sunscreen, the sightseers stuck out among the dark-skinned natives that wandered along the beach ahead, pointing out the flora and fauna of Kenya to other rich, white tourists. Hiari smiled. She loved seeing Lamu’s famed mangrove forests through the eyes of the uninitiated. It would be too easy to become bored of the beautiful forests, with their tangled root systems that plunged down into the salty water of the Mto wa Takwa, or Takwa Creek. 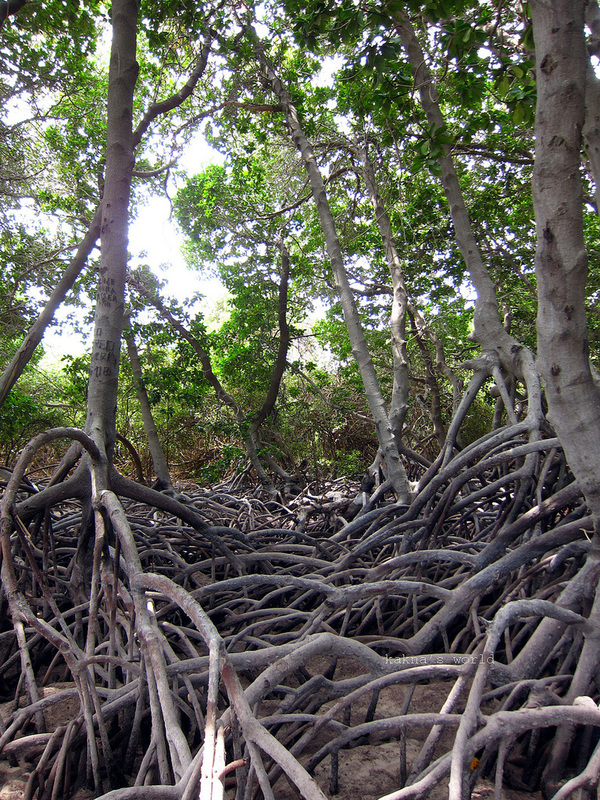 The forest lived just as easily in shallow water as it did on land, and if you stepped carefully, you could walk for dozens of metres out over the water without getting wet, just by climbing on the thick roots of the mangroves. The old boat brushed gently up onto the shore and Hiari jumped out and jammed an anchor pin into the thick clay of the riverbed. She then helped her tourists out onto the beach and pointed them towards a settling flock of saddle-billed storks, whose monochromatic plumage contrasted sharply with their brightly coloured and banded bills. Hiari hummed to herself as she watched the couple delicately approached the gawky birds. She closed her eyes and turned her face up to the sky, allowing the sun to warm her dark skin. The beads she’d tied at the end of her cornrows jangled against the back of her neck and she almost laughed aloud as they tickled her. If any tourists had been looking at her then, in her simple red t-shirt and black pants, with her bare feet digging into the dark clay and her bright smile reflecting the warm light of the sun, they might just have considered a permanent move to Kenya. Hiari opened her eyes and got back to business. She reached into the boat and pulled out the picnic box, thumping it onto the ground beside her and opening it up. She had just started to unload it, placing carefully prepared foodstuffs onto the beach beside her when she noticed that the constant chattering her tourists had been subjecting her to all day had gone quiet. Hiari’s heart quickened. She’d heard about occasional muggings on this island, but hadn’t seen anything happen in the few weeks she’d been running the tour. Time slowed for Hiari. Her feet seemed glued to the clay. She didn’t know what to do; her throat went dry, too dry to call for help. In front of her, the couple was cowering in fear. The beach was deserted now, the mugger had waited until all the other tours had vanished. The river was dotted with dhows; the single-sailed crafts were full of locals, tourists, and guides, but no one seemed to be aware of what was happening on the beach. Hiari started to shake. She had long since learned that cautious fear was good for one’s health; it had kept her safe in the slums because she’d simply been too frightened to go out. But she had never been in danger like this before, and suddenly her mother’s ambitions of escape didn’t seem so excessive after all. A glass bottle of pop slipped out of her hand and landed on the clay with a dull thud. The mugger must have heard it; his head swivelled sharply in her direction, his eyes narrow and his pupils dilated. Even from this distance, Hiari could see that he wasn’t at all pleased to have a witness to his crime. The couple took the opportunity of his distraction and made a break for it, sprinting back towards the boat and the safety of the river with loud shrieks. Behind them, the flock of storks rose into the air in a noisy tornado of feathers, their cries slicing through Hiari’s nerves, setting her even more on edge. The mugger jumped at the noise, but raced to follow his targets a split-second later, his black eyes darting back and forth between them and Hiari. Hiari panicked. She discovered that her legs were working again as she turned and bolted away from the boat, abandoning her clients and her ride, the quick pang of guilt she felt quickly overridden by the adrenaline racing through her veins as she tore over the hard clay towards the mangrove forest. She heard yelling behind her as the tourist couple made it safely to the boat and pushed off into the river, out of reach of the would-be mugger. A cry of frustration reached her ears as the thief abandoned the tourists and, out of options, turned towards the only other person he had the chance of getting his hands on: Hiari. He was fast, and his footsteps sounded louder and louder behind her as he gained ground, his angry swearing sending a wave of harsh Swahili after her. Hiari found her voice, and screamed out over her shoulder, “Niache!” Leave me alone! She heard no response but the grunting of his breath as he drew closer. Hiari reached the tree-line and jumped up into the root system of the mangrove forest. 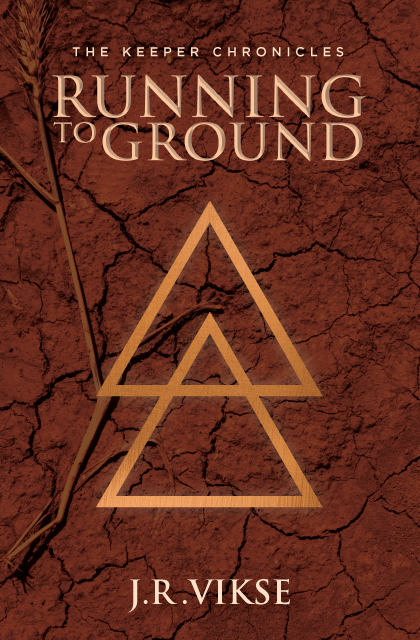 She leapt from one root to the next, her bare feet grasping at the thick stems and then pushing off to the next. With speed and dexterity she wound her way through the trees, but she wasn’t quick enough. She heard a noise behind her and looked over her shoulder. The mugger had gained ground and could almost reach her, his long legs helping him take roots two at a time. Hiari cried out in terror. As if in response to her scream, a strong flurry of wind blew down from above, blasting through the thick canopy of leaves and pushing her from behind with stronger and stronger gusts until she was finally lifted off her feet and thrown forward, her arms and legs splayed out behind her. Her shriek was lost in the roar of the wind as she shot forward as if from a cannon, leaving the astonished mugger behind. The pitch of the engines changed suddenly as Aiden felt the ship swing to port beneath him. The unceasing hum he’d grown accustomed to was broken by the sounds of clanging bells and men shouting, “All hands!” The passage outside the cabin door was suddenly filled with the clatter of rushing footsteps as sailors hurried to their posts. Aiden moved to the bulkhead and peeked out the porthole, his tall and lanky frame allowing him a view of the darkness beyond. He pushed his messy brown hair out of his eyes and tried in vain to make out anything. All he could see was black. Black sea, black sky. A jiggling sound at the door was the only warning he had, and Aiden whirled around and slid the journal he’d been reading behind his back and into the waist of his pants just as his father burst into the room. Callum Swift looked down at his fifteen-year-old son with suspicion in his eyes, and said, “You’re still awake? It’s almost midnight.” He waited for a response, but Aiden didn’t offer one. Callum frowned and turned away, brushing his hands down the slim lines of his uniform. He spoke in the clipped tones of a professional seaman. “They’re calling all hands. The captain is taking us north. 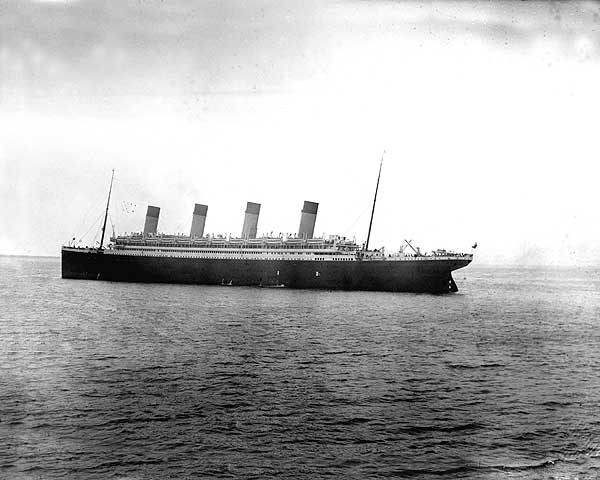 The Titanic is sinking.” Callum talked to his son over his shoulder as he threw open his trunk and dipped into his belongings, pulling on a heavy sweater and jacket. He didn’t have time to wonder about the guilty look that his son had been wearing when he’d entered the room. Aiden gaped behind him. The Titanic? Sinking? He’d been reading about the so-called ‘unsinkable’ ship in the papers for weeks before they’d left New York. It seemed impossible! Reluctantly, Callum nodded and motioned towards the trunk. Aiden whooped and dove forward, fishing out a brown jacket that he threw over his woolen turtleneck sweater. He tugged on a pair of wool socks and perfunctorily laced up some old, worn boots that didn’t even come close to reaching the bottom of his knee-length trousers, and then followed his father as they joined the rush of crewmen headed for the deck.